The Microsoft Word Researcher is a new service announced today intended to assist users in locating sources for scientific papers, and other similar works. The forthcoming addition to Word implements Microsoft's Bing Knowledge Graph to corral relevant content, with proper accreditation. The Researcher function is available today for Windows users. Mobile support and macOS implementation of the feature is coming soon, with no specific timetable given. 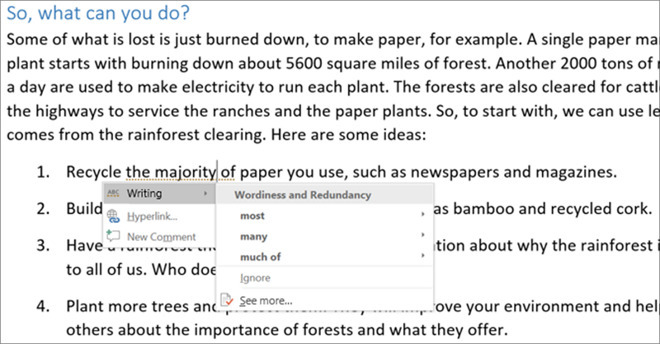 Microsoft Word Editor is an expansion on conventional grammar and spelling tools already included in Microsoft Office 365. The feature uses machine learning along with contributions from a team of linguists to help users improve writing by identifying unclear phrases, highlighting duplication of phrases, and similar hints. Editor is not rolling out today, but is coming soon across the entire range of Office 365-compatible devices. The initial execution of the feature highlights problems, and suggests fixes with little context. Starting in the fall, Editor will explain why a highlighted word or phrase may need to be altered. Also live today is the Focused Inbox feature, now across all Office 365 compatible devices. Previously available on iOS, the Focused Inbox replaces the "Clutter" folder, and separates emails important to the user from other emails in discrete tabs. As with the mobile version of the feature, the feature learns from user behavior to fine-tune email filtering over time. Users can access Office 365 Home with support for five users for $100 per year, or $10 per month. A single user license sells for $70 per year, or $7 per month. Microsoft has been delivering additions to the Office suite first to Office 365, rather than employing the company's previous long waiting period for major new software releases.